This is the easiest plantain recipe to prepare. If you are just home from work and you have either ripe or unripe plantain in your pantry and some palm oil, then in about 15 mins (depending on your stove's heating capacity), you have a quick meal on your table. This dish is usually eaten with pepper sauce. 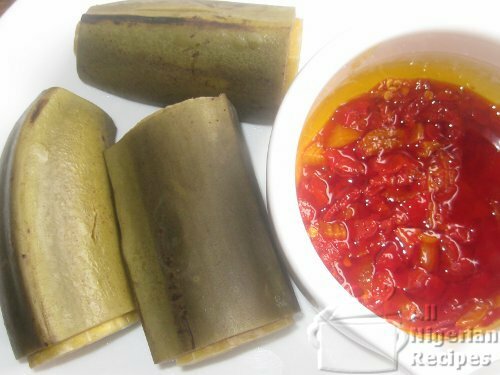 But if you do not have pepper, or will not be bothered with getting that prepared, the good old palm oil and salt will do. Ripe / Unripe Plantain: as many pieces as you can eat! If using ripe plantain, ensure that it is still very hard otherwise, it will be watery when done. Wash the plantain and cut each fruit into two or three pieces depending on how big the fruits are. Put in a pot, add some water and set to cook. Meanwhile chop the onions and chilli pepper. Heat some oil (just enough heat to melt it). Pour in a plate and add the chopped onions and chilli pepper. Add salt to taste. Cook the plantain till done, add some salt to your taste and allow to simmer for a few more minutes. If using ripe plantains, be sure to watch the cooking closely because it will get done quicker than unripe plantains. The boiled plantain is ready to be served. Remember to remove the peels before eating!